A video circulating online shows four women, believed to be foreigners, brawling in the middle of 122 Sims Ave, without a care for oncoming traffic. Although it is unclear exactly when the incident occurred, a video showing the violent fight was posted on social media this morning. 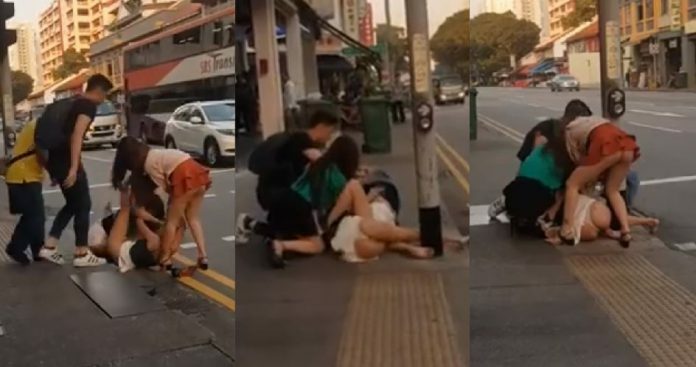 In the nearly 4-minute clip published by Facebook page ‘Singapore Peasant,’ four women dressed scantily can be seen pulling one another to the ground and grabbing fistfuls of one another’s hair as passersby watch in horror. Pretty girls fight so fierce. Is this Geylang? Even though the video was only published about five hours ago, it has garnered nearly 782,000 views, over 16,000 shares, over 3,000 reactions and about 2,800 comments.